An enthralling Boxing Day victory over Charlton has provided a boost that this team is in desperate need of. It was a high intensity, hard-running performance that hopefully sets the tone for the rest of the season. With such a short period of rest between the Charlton game and this upcoming meeting with Southend United, there is no time to dwell on an encouraging performance nor much of an opportunity to recover the energy levels that have surely been expended. The big team selection decision for Mark Robins is how Luke Thomas is replaced in the starting XI after the winger picked up a concussion at the end of the Charlton game that rules him out for both this game and the trip to Wycombe Wanderers on New Year’s Day. With Michael Doyle reportedly available for selection, there seems a strong likelihood that Tom Bayliss will be pushed out to the right of midfield as Thomas’ replacement, despite all the evidence this season pointing towards this being a poor decision. The alternatives involve either taking Jordy Hiwula away from the striker position in which he impressed against Charlton to play on the right wing, pushing Dujon Sterling forward from right-back, or handing Reise Allassani a first league start. While Mark Robins has options, it underlines just how important a player Luke Thomas has become that he cannot be replaced without massive altering the balance of the side. It would be huge blow were Thomas to return to his parent club in January. Elsewhere, Brandon Mason’s injury-enforced substitution on Boxing Day suggests that Robins may be forced into restoring Junior Brown at left-back. While Mason looks a bright prospect, he was again targeted physically, which cost us a goal. It’s unfortunate as Mason will only learn from experience, which this injury may prevent him from doing so, but Brown, despite his error-proneness, provides a more solid presence at left-back currently. While it’s strange to describe a game decided by a late, heavily-deflected, winner as a routine away victory, that was how our meeting earlier in the season with Southend felt like. The Sky Blues should have been two up in the first-half after an early corner-kick routine had crossed the line without the officials’ knowledge, before Jordy Hiwula poked home from a similar situation to hand us the lead. Although Southend rallied in the second-half, it took a lapse in concentration to see them equalise, however, Jodi Jones was on hand late on to force home the game’s decisive goal. Already a hero at Southend from his playing days, Chris Powell has been a solid presence in the dugout since taking over at Roots Hall nearly a year ago. His Southend side have occasionally threatened the play-offs, but have struggled for consistency and sit, like ourselves, pretty much slap-bang in mid-table playing well-organised and resolute football with the occasional flash of flair..
A large part of their inconsistency this season has been driven by an awful run of serious injuries robbing Powell of a settled line-up. Key players such as Ben Coker at left-back and Tom Hopper in attack have sustained season-ending injuries, while first-choice keeper Mark Oxley is also likely to be out for this game. The key man for Southend is Simon Cox up front. While not the biggest or quickest of strikers, the experienced Cox’s nous around the penalty area make him an important player in both the taking and creating of chances for the Essex side. He is likely to be jointed in attack by the quick and strong Theo Robinson, at times an exciting player but one who tends to blow very hot and cold. 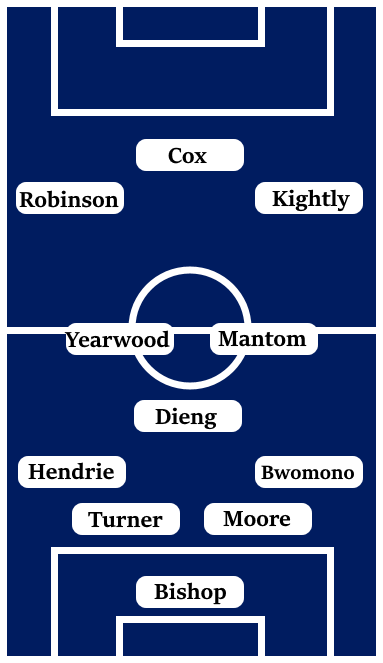 In central midfield, Sam Mantom and Timothee Dieng have been significant presences for Southend this season. Mantom offers composure on the ball and can also drive forward and threaten the opposing defence with long-range shooting or crosses into the box. Dieng is a physical presence who is often a threat from set-pieces or by making late runs into the penalty area. With Michael Kightly and Stephen McLaughlin out wide, with Jason Demetriou getting forward from right-back, Southend have a number of players in their squad who can threaten with accurate crossing. At the back, Southend can call upon the vastly-experienced Michael Turner who is a key organising and physical influence for them. Bristol City loanee Taylor Moore has impressed as Turner’s defensive partner this season, offering mobility to cover for Turner’s increasing lack of pace while also providing a reasonable physical presence himself. Likely to be without their first-choice goalkeeper, we should be looking to put Southend’s young keeper Nathan Bishop under pressure whenever possible. While the youngster is highly-rated, inexperienced goalkeepers are prone to mistakes, especially from set-piece situations, which perhaps lends some credence to starting our most effective set-piece taker, Michael Doyle. Like a lot of teams at this level, Southend don’t have a lot of pace at the back. With full-backs instructed to get forward to overlap on the wings, we should be looking to get in behind their defence. Losing Luke Thomas will be a blow for us in that regard, although this may be an ideal game for Jordy Hiwula to really stretch the opposition.